I always like to have some epoxy putty on hand. It’s easy to use, hardens quickly and can be machined easily. It’s an awesome thing to have on hand. Unfortunately, it only comes in one color (gray) and you have to mix it by kneading two parts together. Unless you’re wearing rubber gloves this will leave a stinky residue on your hands which can get all over other parts if you are not careful. This is Jane. She’s from Ireland and she’s lovely. Jane was studying product design at when she had an idea: “I don’t want to buy new stuff all the time. I want to hack the stuff I already have so it works better for me.” So she phoned some clever materials scientists called Ian and Steve and together they invented an interesting new material for hacking things better. 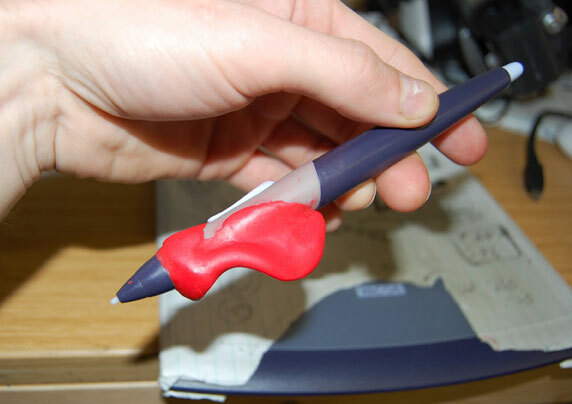 It’s called sugru and is a little bit brilliant. I haven’t tried it yet but I will let you know once I get my hands on some. Bokode – the next Barcode? Some new work coming out of MIT’s Media Lab may change this. Called Bokode, the system uses the Bokeh optical effect which maps how rays entering an out-of-focus camera lens will converge onto the camera’s sensor. To see the details, you’ll have to watch the attached video, but in essense the “tag” consists of an LED with an encoded optical pattern and a small cheap lens. An out-of-focus camera will see the data on the tag’s pattern, whether it is a digital code, an image, text or whatever. What’s more, the camera can also determine the angle of the object by doing some tricky optical calculations (which I don’t understand yet). The tech is still in the development stage, but there is a development WIKI to exchange information among those interested in working more with it. Give it a read – looks like really fun stuff!